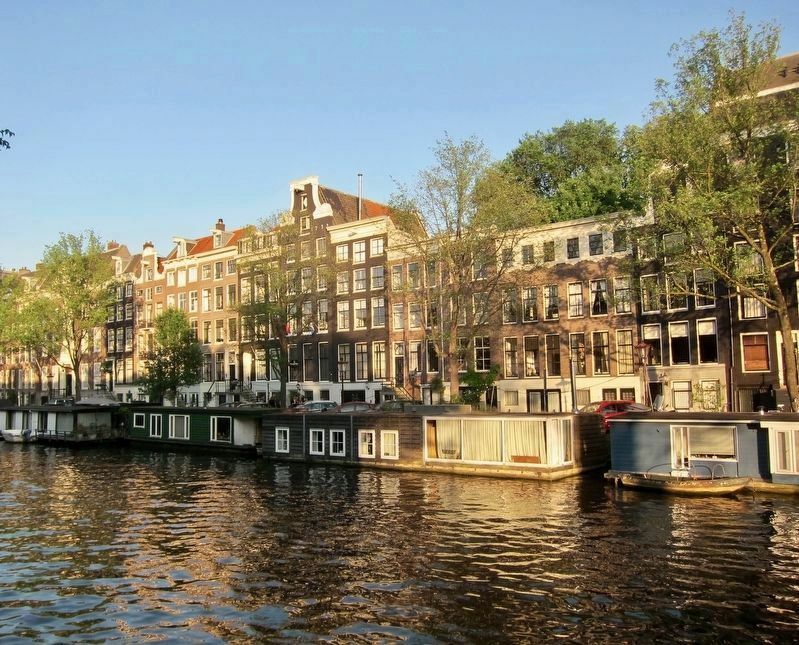 Tijdens de Tweede Wereldoorlog zijn meer dan 200 bewoners van deze gracht vermoord omdat ze Joods waren. Links van u staan hun namen op de kade, tegenover hun huizen. De Schaduwkade is een initiatief van bewoners van de Nieuwe Keizersgracht en werd in 2013 voltooid. 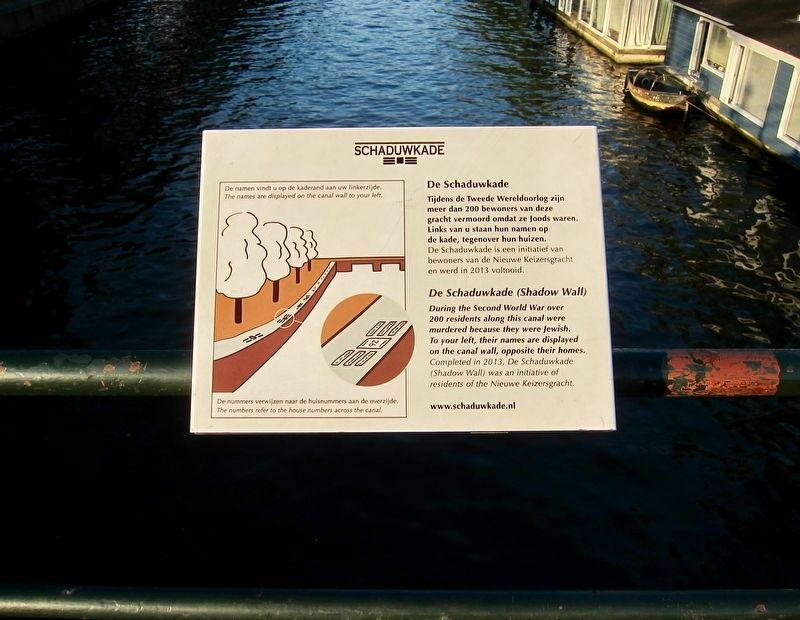 During the Second World War over 200 residents along this canal were murdered because they were Jewish. To your left, their names are displayed on the canal wall, opposite their homes. Completed in 2013, De Schaduwkade (Shadow Wall) was an initiative of residents of the Nieuwe Keizersgracht. Erected by Bewoners van de Nieuwe Keizersgracht. Location. 52° 21.876′ N, 4° 54.152′ E. Marker is in Amsterdam, North Holland. 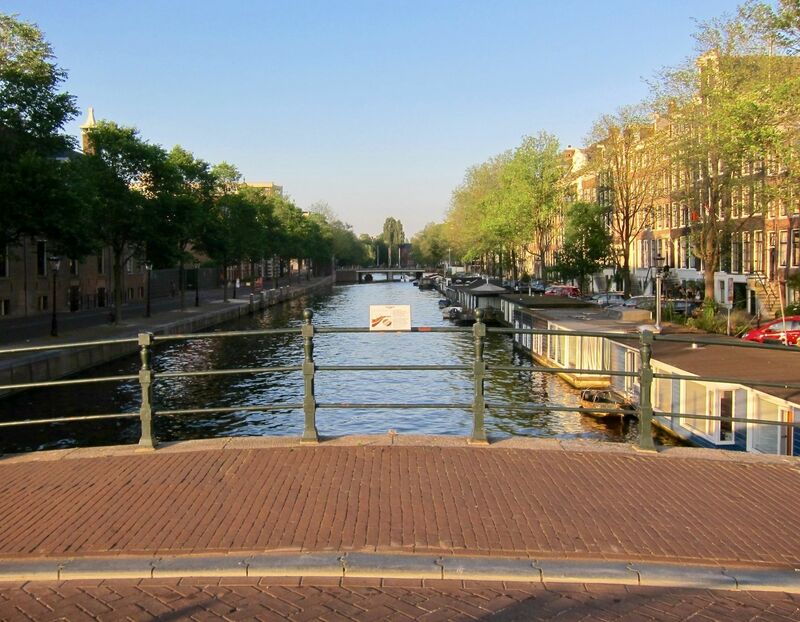 Marker is at the intersection of Amstel and Nieuwe Keizersgracht, on the left when traveling north on Amstel. Touch for map. Marker is in this post office area: Amsterdam, North Holland 1015 CP, Netherlands. Touch for directions. (about 210 meters away); Museum Willet-Holthuysen (approx. 0.3 kilometers away); E.J. van Det School Memorial (approx. 0.3 kilometers away); J.C. Amman School Memorial (approx. 0.3 kilometers away); Het Arsenaal / The Arsenal (approx. 0.3 kilometers away); de wereld bleef doof / The World Remained Deaf (approx. 0.3 kilometers away). Touch for a list and map of all markers in Amsterdam. More about this marker. 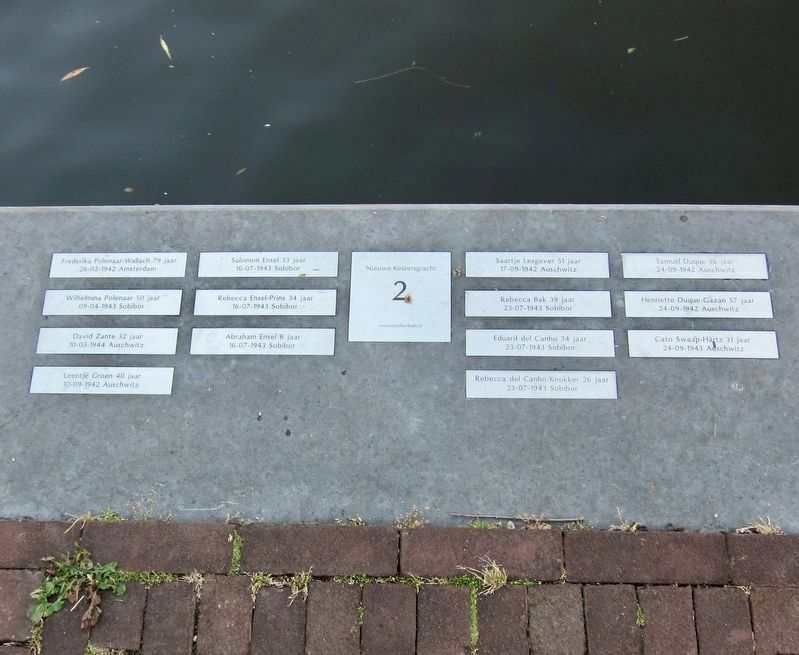 The marker is found on the Nieuwe Keizersgracht Bridge, by the Amstel River. There are two identically worded, albeit differently designed, additional markers nearby. One on the north side of the canal, about 50 meters to the east, and the other about 100 meters to the east, on the Weesperstraat as it crosses the canal. Regarding De Schaduwkade (Shadow Wall). The memorial was dedicated on May 26, 2013. This is found on the north side of the canal, with the subject houses being located on the south side. The house addresses increase the further east (i.e. away from the marker) one goes. This address would be for the house closest to the marker. The house numbers increase going from right to left, with Nieuwe Keizersgracht 2 being on the far right. More. Search the internet for De Schaduwkade (Shadow Wall). Credits. This page was last revised on January 28, 2018. This page originally submitted on January 27, 2018, by Andrew Ruppenstein of Sacramento, California. This page has been viewed 61 times since then and 6 times this year. Photos: 1. submitted on January 27, 2018, by Andrew Ruppenstein of Sacramento, California. 2, 3, 4. submitted on January 28, 2018, by Andrew Ruppenstein of Sacramento, California.